The Green is a well used open space, freely accessible to the public in the heart of the Town. The Green is used for Fairs, Circuses, charity and community events. The Green is split into two by the A342 Andover Road and for reasons which become clear when you visit are called the Large Green and Small Green. 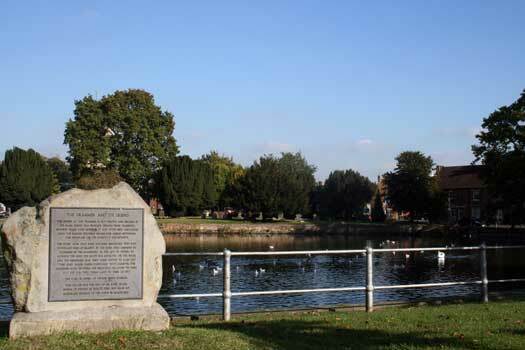 Perhaps the most famous local legend is that of the Moonrakers, which is reputed to have taken place at the Crammer (the town’s pond) . The story goes that a group of Wiltshire smugglers heard the Excise Men approaching the town, therefore they had to quickly conceal the contraband brandy they were carrying by rolling the barrels into the Crammer. Once the Excise Men had passed, the smugglers needed to recover the barrels using a rake. The Excise Man were suspicious and therefore came back to take a second look. Catching the men with rakes they demanded to know what they were doing. Not being stupid, one pointed to the reflection of the moon in the water and said that they were trying to rake out the cheese from the water. The Excise Men left, laughing at how stupid Devizes people can be. However it was the smugglers who had the loudest laugh as their quick thinking had stopped them being caught. To this day, Wiltshire people are known as ‘Moonrakers’. So what can you feed the ducks? It turns out that ducks are quite partial to a sweetcorn. Tinned, frozen or fresh! Obviously, remove them from the tin first. As a nation we’re guilty of throwing away a vast amount of lettuce, especially the bagged variety. Instead of consigning it to the bin, rip it into pieces and treat your local ducks. Rocket, Kale and Iceberg are all great choices. Wild ducks will appreciate a handful of leftover rice from a takeaway. Just remember to keep the crispy duck all to yourself. You can also use uncooked rice are both fine. For your free guide from the Canal and Rivers Trust, click the link below.